With the launch of the headphone-less iPhone 7, Apple turned truly wireless earbuds into a mainstream thing. The AirPods, much as people make fun of them, proved that you can make legitimately usable headphones that have zero wires. But the AirPods’ styling is unique, to say the least, and a lot of people clamored for the same tech in a better-looking package. That’s what Skybuds, the Airpods-equivalent from Alpha Audiotronics, claims to do. The Skybuds work much like the Airpods: there’s two earbuds, which separately use Bluetooth to connect to your phone. There’s also a wireless charging case, which lets you store your earbuds while you’re not using them and recharge them. Everything’s managed by the Skybuds app, which has a bunch of neat features like a map to help you locate your buds, sliders for changing volume settings, and even an “Awareness” mode that lets through a little background noise to help keep you aware of your surroundings. Connecting the Skybuds for the first time is about as fiddly as you’d expect: both earbuds and the case have to be paired to your phone separately, so there’s a lot of pushing buttons, monitoring status lights, and generally waiting for machines to cooperate. It’s tedious, and more difficult than syncing AirPods to an iOS device, but you only have to do it once. After pairing for the first time, the Skybuds will connect automatically when you pull them out of the case and turn on. Audio is consistent and has exactly the range you want from Bluetooth devices, giving you enough range to leave your phone and walk to the bathroom without losing signal. In terms of audio quality, you have to remember that they’re Bluetooth buds: you’re not going to come close to a set of wireless over-ear headphones, even if these do cost $200. I’d say the audio quality is similar to what you’d get from a $30-50 pair of wired earbuds. Your socks aren’t getting blown off, but there’s no sound that’s noticeably bad or irritating. I found the fit to be much better than the audio quality, and arguably the best thing about these headphones. The earbud sits in your ear canal, and the longer back part of the pod wedges against the inside of your ear, holding it firmly in place. It’s not the most comfortable arrangement, but for a 30-minute commute or an hour-long run, they don’t get dislodged and there’s no real chafing. The fit also feels comfortably secure, in stark contrast to how the AirPods feel. I’d say battery life is good for 3-4 hours of consistent listening, and the case has enough capacity to charge them a few times over before it dies. I was using them as my everyday headphones for weeks, and found myself charging up the carrying case (via a microUSB cable) once every couple days. The only real sticking point is price. The Skybuds retail for $200, which you’ll notice is more than the $160 Apple charges for AirPods. I would say the Skybuds are better if you plan on using them every single day, as the fit and audio quality are more important for extended listening. 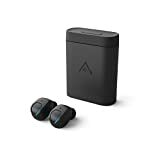 But the AirPods are faster to connect, have a slicker carrying case, and generally less fiddly to use with an iPhone than the Skybuds. That’s just the result of Apple being able to closely design the AirPods to work with the iPhone, and Skybuds being restricted to third-party dev tools. But it does mean the Airpods edge out the Skybuds for convenience, and I’d argue that’s more important for some people, who just want a pair of headphones to carry around and use to watch the occasional YouTube video.